Welcome to the Triana Public Library. Our library is more than just a home for books. We have new release movies, remote computer classes, copying and printing, free Wi-fi to surf and download digital books and music, and so much more. We offer amazing family-oriented programming such as our storytime on Thursday mornings at 11 a.m., our Coffee, Cake, and Conversation Book Club, and family movie nights. All of these services are yours to enjoy for free with your library card. Come see us, and get connected! 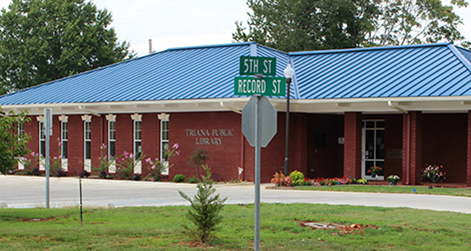 Read more about the Triana Friends of the Library. Take I-565 West toward Madison. Take exit 13 toward Madison Blvd., and merge onto Madison Blvd. After approximately 2 miles, turn left at the light onto Zierdt Road. Turn left at 6th Street and the Library will be located on the right side of the road.